Having watched Drive last night in the sweltering heat of an Indian summer, I now find myself in a car, windows down, cruising the roads of England, the movie’s soundtrack still ringing in my ears and echoes of Nicolas Winding Refn’s latest feature reverberating through my mind. As a non-driver I’ve never really seen the thrill in being behind the wheel and movies or computer games that focus mainly on speeding vehicles and high risk chases on four wheels have just never appealed to me. However, Drive isn’t simply another car movie, despite the studios’ initial attempts to convert James Sallis’ original novel into a Hugh Jackman franchise along the same lines as The Fast and the Furious. Instead director Winding Refn, along with his lead-star Ryan Gosling and screenwriter Hossein Amini, have created a film of real substance, a film about a stunt driver, a film about a getaway driver, but a film that doesn’t simply focus on high velocity pursuits and super powered “pimped” cars. Danish director Winding Refn burst onto the movie scene with his hard-hitting tale of a drug deal gone bad bad in 1996’s Pusher. However, in recent years his eclectic style has seen him take on a theatrical retelling of the life of Britain’s most dangerous prisoner with Bronson and the story of a mute Viking slave in the powerful Valhalla Rising. Now with his 8th and possibly most accessible feature to date, Winding Refn’s hard work over the last 15+ years is finally gaining him the recognition he deserves with a Best Director award at this year’s Cannes film festival and Drive gaining critical acclaim from all that see it. Drive is a fast paced action thriller that focuses on a Hollywood stunt driver, a loner by nature, who moonlights as a getaway driver-for-hire in the criminal underworld. He finds himself a target for some of LA’s most dangerous men after agreeing to aid the ex-con boyfriend of his beautiful neighbor in a job that goes dangerously awry. The only way he can keep her safe and stay alive is to do what he does best: Drive. At the core of Drive, giving it impetus and adding real nerve-shredding tension is a throbbing score by composer Cliff Martinez. 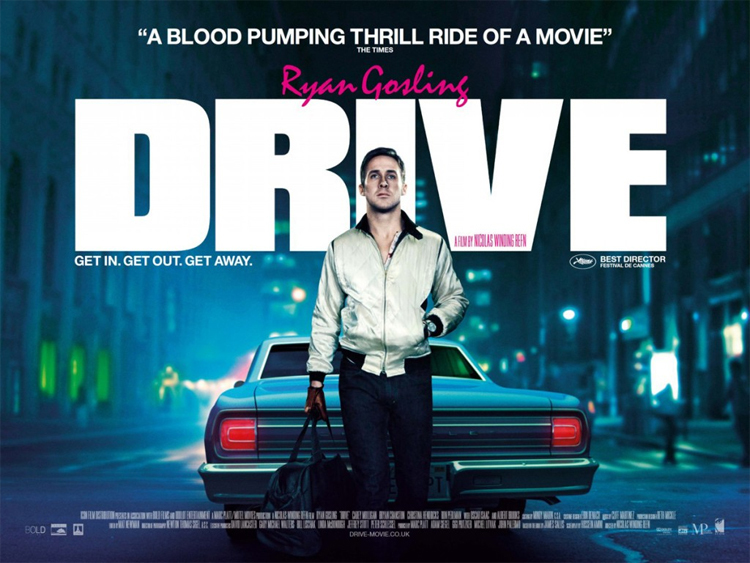 From the opening moments of Winding Refn’s film, as we’re introduced to Gosling’s Driver through a taut chase sequence, the importance of the original music in Drive is clear to see (or hear). If Winding Refn is the brain of Drive and Gosling the face, then the soundtrack is the film’s heart, its beat rising as the Driver’s situation worsens and a feeling of unease sets in. The original music combines with 80s inspired tracks from Kavinsky, Chromatics and Desire to make not only one of the best soundtracks you’re likely to hear all year, but also to form an integral, unforgettable part of the machine that is Drive. Working in partnership with Martinez’s original score to create the film’s intensity are two powerful performances from lead actors Ryan Gosling and Carey Mulligan. Combined, they only mutter a couple of dozen short lines throughout the film, however, the extended silences and longing looks between the pair tell us so much more than extended dialogue and back stories ever could. We’ve seen flashes of Gosling’s brilliance in Half Nelson & Blue Valentine and glimpses of Mulligan’s leading-lady potential in An Education & Never Let Me Go, however together their combined on-screen presence seems to spark and ignite the fuse on Winding Refn’s explosive film. The film is at its best when the pair share screen time, their emotions seemingly bubbling under their cool, calm exteriors, never wanting to make the first move and expose their true feelings. However, this is one of those relationships that seems doomed from the start as estranged partners and violent criminals play their parts in keeping the couple separate. Real moments of intimacy only come in situations of dire straits and as the tangled web restricts around them, you’re left wondering if this is a love best left alone. I’ve just finished watching this. I was gripped from the start all the way through to the end. Faultless.